We are able to offer in Home Veterinary care. Click to learn more. Are you too busy to come into the clinic? We do house calls, too! If you live in Vineland or the surrounding area and need a trusted veterinarian to care for your pets – look no further. 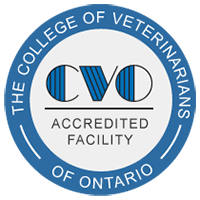 Our hospital and doctors are all licensed by the College of Veterinarians of Ontario, treating dogs, cats and other small pets. Your pets’ health and wellbeing are very important to us, and we take every possible measure to give your animals the care they deserve. West Niagara Animal Hospital is a full-service animal hospital and welcomes pet patients in need of routine medical, surgical, and dental care. We have years of experience treating serious conditions and offering regular pet wellness care. Beyond first-rate pet care, we make our clinic comfortable, kid-friendly, and calm, so your pet can relax in the waiting room and look forward to meeting our veterinarians. We are happy to offer a number of resources that enable you to learn about how to take better care of your pets. Please feel free to browse our site, particularly the informational articles. The best veterinary care for animals is ongoing nutrition and problem prevention, so becoming knowledgeable about preventative pet care is essential to the ongoing success of your animal’s health. If you have any questions, call (905) 562-9049 or email us and we'll promptly get back to you. Our Vineland veterinarian office is very easy to get to, it is directly across the street from Vineland Foodland-- just check out the map below for directions! At West Niagara Animal Hospital, we treat your pets like the valued family members they are. Rachel is our fantastic animal care assistant. Dr. Melissa Hardy graduated from the Atlantic Veterinary College in PEI in 2012. Julie is a Registered Vet Tech from Sheridan College. Marie is a Registered Veterinary Technician who has worked with us at WNAH since the 'beginning' in 2004. "The staff are very knowledgeable and professional! So glad we made the decision to bring our puppy and cats to be a part of clientele at West Niagara Animal Hospital!" "My kitty Rusty fell off the bed today and hurt/jammed his tail badly. He was in so much pain. They saw him right away treated his pain and made a diagnosis. The treatment plan will hopefully save his tail. They were very compassionate and professional. I was extremely upset at the time but knew he was in the best hands. They always have the critter's best interest at heart and it shows. Thanks for a great job. We're both feeling better." "Great experiences at West Niagara Animal Hospital! They take the time to listen and understand all the complexities that come with taking care of our awesome pets." "They are truly amazing people! I could not have wished for a better place!" "Great staff. Always do everything they can to ensure highest quality service and illustrate their clear passion for helping animals. Lovely environment."